Red Chilli powder, Coriander, Fenugreek, Tamarind, Salt, Sugar, Compounded asafetida, Mustard, Rice flour, Toor dhal and Curry leaves. COOKING DIRECTION:Heat 2 tbsp of gingelly oil, add desired vathal, 50g vegetables, fry well. 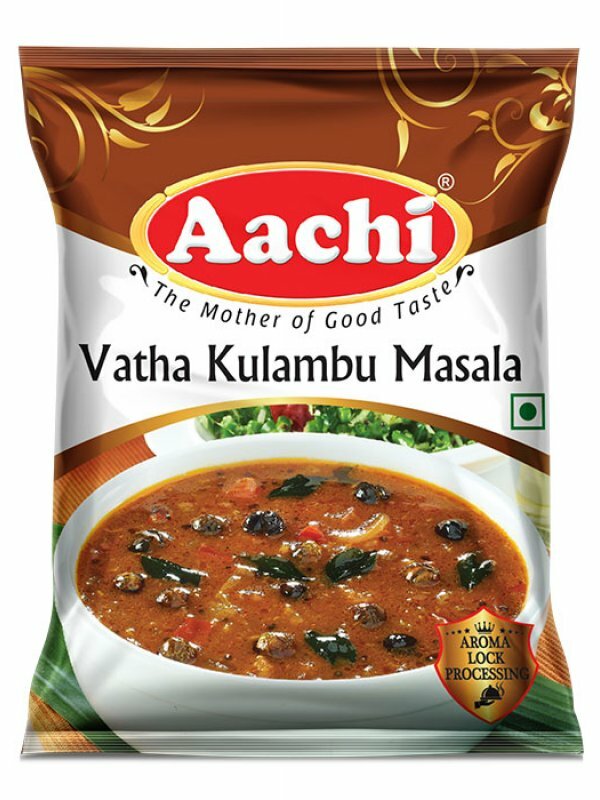 Add required amount of Aachi vathakulambu masala and 2 ½ cups (400ml) of water and 100ml of tamarind juice, boil until thick. Option 1: Fry few garlic, small onion & finely cut tomatoes along with vathal and prepare as above. Option 2:Instead of vathal fry cauliflower/ drumstick/ mushroom/ ladies finger (200 gms) in oil. Optional: Along with the fried vegetables add 1 ground tomato with little coconut. Finally add required amount of Aachi vathakulambu masala at the end before removing from fire.